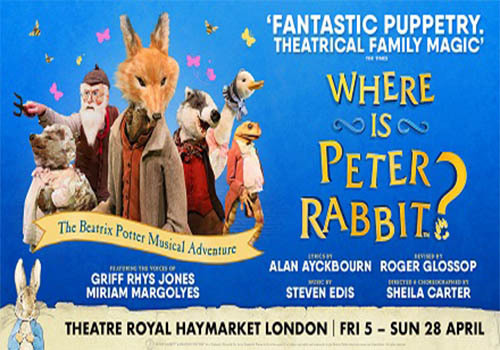 Enter the magical world of Beatrix Potter in this enchanting theatrical spectacular at the Theatre Royal Haymarket. Watch your favourite stories and beloved characters from Beatrix Potter's tales come to life! Meet Jemima Puddle-Duck, do the laundry with Mrs Tiggy-Winkle, watch out for the wicked Mr McGregor, and fall in love with cheeky Peter Rabbit. The show is filled with beautiful handcrafted puppets, 14 original songs, and a dusting of magic. Where is Peter Rabbit? Includes voiceovers from national treasure Miriam Margolyes and TV and stage personality Griff Rhys-Jones. The songs, written by Sir Alan Ayckbourn, will all be sung live on top of a delightful dancing set. These stories are passed down through families and hold a special place in our hearts, so whether you want to introduce someone to Beatrix Potter, or watch for the nostalgia, this production is a charming delight for the whole family. Where is Peter Rabbit? Plays at the Theatre Royal Haymarket from the 5th – 28th April 2019. Where is Peter Rabbit is suitable for the whole family, particularly young children. The show is not suitable for children under the age of 3. Click here for the Theatre Royal Haymarket seating chart and seat price guide.